As well as delivering workshops to groups and schools around the country, I run regular glass-fusing and leaded-glass workshops near my base near Scotter, North Lincolnshire for adults (and for some workshops, accompanied children). I will also happily travel to give workshops to schools, colleges and community groups such as WIs, scouts, guides and so on. All the workshops are informal, friendly, fun and suitable for all. They’re great for beginners and for those with a little more experience of working with glass. 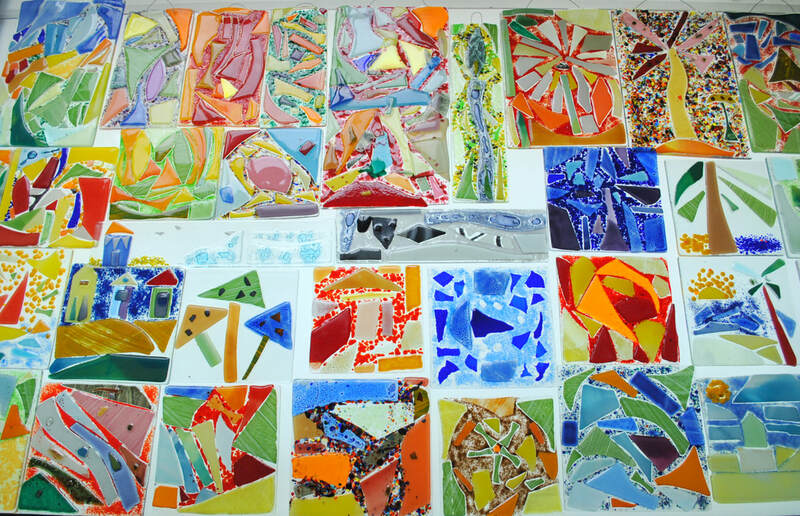 For the day or half-day workshops, you can make items: decorative glass panels, window hangings, coasters, jewellery or whatever your imagination conjures up. And if you can’t think what to make, I always have examples of what can be achieved to get you inspired. You don’t need previous experience with glass or anything fancy like that. In fact you don’t even need to be particularly arty. I’ve seen some fantastic creations turned out by people who said they weren't creative. All of the work shown below was made by students! Most people come as individuals, others bring friends, or spouses or other family... all are welcome! And you can buy workshop vouchers as gifts. Check the planned workshop dates or contact me to arrange a more convenient time as I am happy to do a workshop at a date to suit you. You can read about the different workshops below. 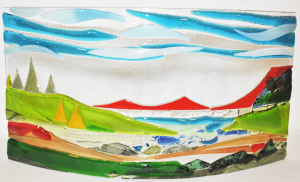 Your choice of a half-day or full day making a number of items in fused glass, such as decorative glass panels, window hangings, coasters and jewellery. If you'd like to make a three-dimensional item such as a bowl, there's an extra £5 charge per item. The glass will be fired in my kiln and returned to you up to 2 weeks later. A full day creating your own leaded glass panel using the traditional technique of leading. I will show you how to cut your glass to your design, create your leaded panel and solder it together. The size of the panel will be approximately 30 cm x 30 cm and have 6 or 7 pieces of glass. An inexpensive taster workshop in fused glass, suitable for adults and children (children to be accompanied by an adult). In this workshop, you'll make a coaster or tile, at a cost of £6 per item: there is no additional fee. The glass will be fired in my kiln and returned to you up around 2 weeks later. The length of the session depends on how long you take to make your item — usually up to an hour or so.